You are here: Home » Rob's Blog » Help me with an iPad app? Help me with an iPad app? My 2 Kids and a Yellow Karmann Ghia. As I was thinking about what to write for this week’s blog I found myself thinking…and thinking…and thinking some more. That thought process is still flying around in my head, and has yet to find a place to land. After attending the EAA Oshkosh Airshow two weeks ago with my dad and kids, airplanes are still on my mind, despite the fact that there are plenty of things happening in the fabulous world of muscle cars. 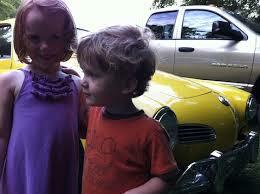 The picture above is of my two older kids and a yellow 1970 Karmann Ghia coupe that was at the airshow. Yes, I realize the irony of taking a picture of a car while attending an airshow. We have a yellow 1973 Ghia in my family that (surprise) I am very emotionally connected to and will someday restore. Truth be told, over the past several weeks I’ve been working pretty much around the clock to keep up with car show season and mini vacations, and I think my brain is ready to just take a few days off. As a self employed business owner I have the luxury of setting my own schedule, but on the flip side I’ve found that my boss (me) is constantly worried about meeting the bottom line and pushes me to work even more to keep everything afloat. I need a mental break. Perhaps a new iPad is just the ticket. Wait, what, you say? How did I jump from writer’s block, to airshows, to feeling sorry for myself, to wanting an iPad? I’m still not sure myself, but let’s go back to my trip to the EAA Oshkosh airshow. One of the coolest things in the world it seems in the aviation community is the iPad. Last year I saw just a few companies there developing new software or devices for the iPad. This year they were everywhere. The coolest things that I saw there was a company called ForeFlight, and pilots will really dig the fact that it is (essentially) automated flight planning. It really got me to thinking; is there room in the muscle car world for the iPad? 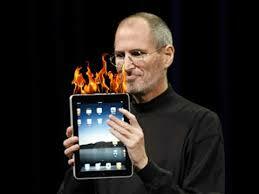 Steve Jobs and an iPad. I assume the flames were added in later. Personally, up until about a year ago I had never used an Apple product in my life. As a result of my business I now use a MacBook Pro on a daily basis, and both my wife and I have iPhones. We have not, however, jumped into the world of the iPad, but after seeing that sucker in action at the airshow I’m scratching my brain pan trying to come up with an automotive application that I can develop for it. The thing is though, most of the car people that I know don’t have iPad’s, and I doubt they’d ever buy one unless there was a really good reason to do so. That means the idea has to be stellar. So, in the end, I’m calling out for your help. What should we make? Here are a few that I came up with. If you have a better idea, I’m all ears (and I’m a good business partner). Unfortunately that’s as far as I’ve made it. That being said, if you have an idea, I’m all ears. I have access to the team that can make it all happen, and it’d just be a matter of making it work. Who has some ideas? I’ve got $100 for the one that looks promising! I’m including this one as well from the airshow – just because I can. 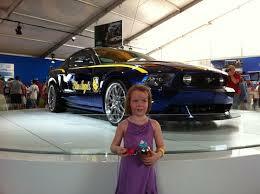 It’s my daughter Emily and the EAA “Blue Angels” Mustang! I love your podcast I catch it each week. I am 48 and only became interested in cars about 2 yrs ago. Thanks to your show I was motivated to start maintaining my own vehicles. Wow! I have saved a lot of money. But I digress. How about an iPad App that allows you to troubleshoot and/or monitor your vehicle. I realize that this is very general but I hope it is enough to fill in the details. I no longer own a “muscle car” the closest that I have is a 1982 Chevy Pickup, 1984 Buick Park Avenue and my daily driver, 1990 Buick Park Avenue. I got it Rob!”Build a Drag Car” app! Here’s how it works,first you pick your car,you could do just street cars like Chevelle’s,Camaros,Mustangs or you could do drag cars like pro stock to top fuel. Then you could build an engine or just pick an engine and then pick your transmission,rear gear,tire,rev limit,the choices are endless! Then you pick 1/8 or 1/4 mile,do a burnout,cut a mean light on the christmas tree and see what time’s you run or if you gave it too much gear you would blow up!I guess that sound more like a game than an app….Can you make that game!…I would play it! Hey Rob, Hello from Aloha Oregon. I think your on to something. How about the app includes all webcams related to live car events? Glad to see also that your site is doing so well. still listening and watching.